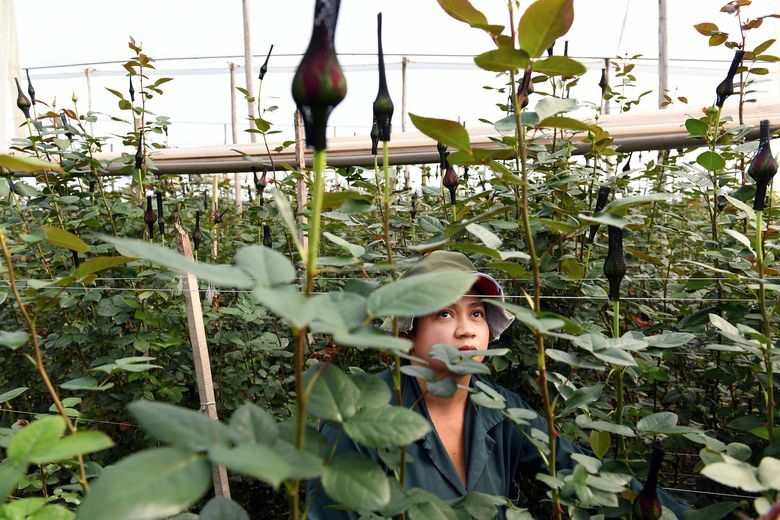 The majority of roses Americans give one another on Valentine’s Day, roughly 200 million in all, grow here, the savanna outside Bogotá, Colombia, summoned from the soil by 12 hours of natural sunlight, the 8,400-foot altitude and an abundance of cheap labor. MADRID, Colombia — The majority of roses Americans give one another on Valentine’s Day, roughly 200 million in all, grow here, the savanna outside Bogotá, summoned from the soil by 12 hours of natural sunlight, the 8,400-foot altitude and an abundance of cheap labor. Thousands of acres of white-tarped greenhouses, some the size of several football fields, are crammed with seven-foot stems topped with rich red crowns. Many are pulled into warehouses by horses, chilled to sleep in refrigeration rooms and then packed with other flowers onto planes — 1.1 million at a time — to be sold in the United States. It’s peak season for a massive Colombian industry that shipped more than 4 billion flowers to the United States this past year — or about a dozen for every U.S. resident. It’s just the kind of decline that President Donald Trump has railed against. Trump, who recently took action against foreign sellers of solar panels and washing machines, is now considering tariffs on steel and aluminum as well as a withdrawal from the North American Free Trade Agreement, changes that would reach deep into the American economy. 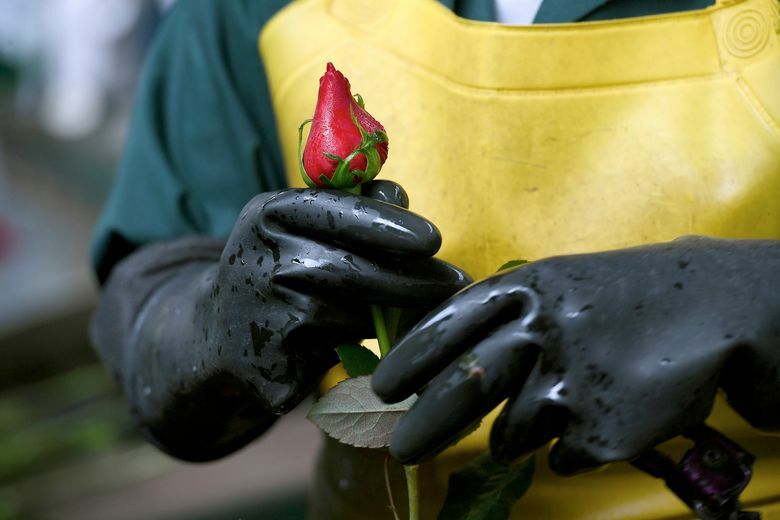 He has promised an unapologetic “America First” agenda that some U.S. flower growers hope could bring them back into the Valentine’s Day rush. Andres Osorio, managing director of Bogota-based Avianca Cargo, said he expects business to be up 7 percent from 2017, and the airline he works for added new warehouse space in Miami to make room for 12 daily flower flights. Inside a steamy greenhouse here on the outskirts of Bogotá, Castro, 57, was dwarfed inside a giant rose bed, surrounded by tens of thousands of bright red roses. He is wearing two hats: a baseball cap to hold his hair tight against his head and a wide-brimmed floppy hat to protect his neck from the near-equatorial sun. He’s one of 850 workers at the Flores de Serrezuela farm, roughly 20 miles west of Bogotá. Every time Castro places a rose in his basket, it enters an integrated supply chain that, through a mix of high-end technology and a few anachronistic touches, gets the flowers from beds outside Bogotá to U.S. retailers in a matter of days — often faster than flower growers in California can get their products to East Coast markets. Here at Serrezuela, the women wear green uniforms, and on the back it says “Nuestra Gente Florece,” which means “Our People Flourish.” There are 130,000 Colombians working in floriculture, and it exports more than 6 billion stems each year to a total of 90 countries. When flowers leave farms outside Bogotá, they are sealed in the back of trucks to prevent anyone from tampering with the delivery. Once they reach Miami, they are X-rayed for cocaine and other contraband. The red roses many Americans will purchase this week are called Freedom roses in Colombia, a particular breed that was put into mass production around the time of the 2001 terrorist attacks in the United States. These roses are durable, bright and strong, but they have little fragrance. They also grow near a major international airport, where planes can reach Miami in under four hours. And, importantly, labor costs are low. The minimum wage in Colombia is around $300 a month. At USA Bouquet Company in Doral, Florida, 75 workers are crowded in one section of the room, putting imported red roses into vases and then carefully packing them in boxes for a Valentine’s shipment to Walgreens. There are dozens of similar warehouses within 20 miles of USA Bouquet. 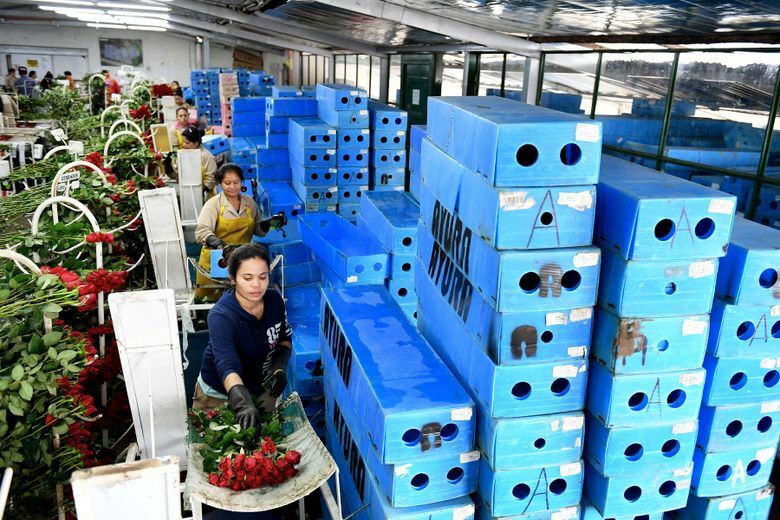 In the weeks before Valentine’s Day, many of them run around the clock, rushing to pack and ship flowers before the next truck arrives.